Turkey is witnessing the relentless imprisonment of Kurdish political activists, arrests of supporters of Fethullah Gülen, and anyone not towing the Islamist-leaning government of President Recep Tayyip Erdogan. Yet, despite month after month of imprisonment, persecution, people losing their jobs, and Turkey resembling all the traits of becoming a dictatorship by stealth, this nation isn’t being kicked out of NATO. Therefore, just like Saudi Arabia sullies democratic nations that turn a blind eye to this feudal monarchy, the same can be said of Turkey mocking the alleged role of NATO defending the democratic world in the northern hemisphere. Reports stress that media manipulation highlights the utter erosion of democracy in Turkey. For example, the government-run Turkish Radio and Television Corporation in the first three weeks of March last year covered over 4,000 minutes of pro-Justice and Development Party (AKP) propaganda, in stark comparison to the pro-Kurdish Peoples’ Democratic Party (HDP) that obtained one minute. Similar enormous disparity equally applied to other mainstream political parties in the run-up to the pre-referendum last year. Hence, the same bias is endless in Turkey because little change is happening to alter the despotic course in early 2018. 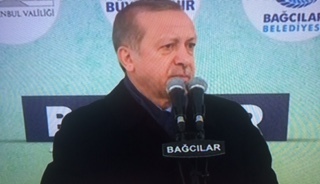 At the same time, journalists that say a minimum against Erdogan face the wrath of this megalomaniac but once more NATO ignores such enormous excesses of power concentration. In truth, it mocks the notion that NATO is in the vanguard of protecting the “free world” because what about the freedoms of the people of Turkey? Of course, since then, this figure is even higher by early 2018 because the fear of arrest is never ending in Turkey under the leadership of Erdogan. Despite this, the organization of NATO remains quiet and uninterested towards important issues related to political freedom and democracy in Turkey. All this is happening when rhetoric out of America, the United Kingdom, and other NATO powers are obsessively upping the ante against the Russian Federation based on a new Cold War. The mantra is “protecting democracy against the threat of an encroaching Russian Federation.” Of course, it is NATO that is increasingly encroaching and militarizing along the geopolitical space of this nation according to the opposite view in the Russian Federation. However, irrespective if individuals seek to blame NATO or the Russian Federation over Abkhazia, Crimea, and South Ossetia, the democratic mantra by NATO is meaningless based on events in Turkey. Hence, if NATO is serious about being in the vanguard of protecting the democratic model in Europe and North America, then Turkey must be suspended under the leadership of Erdogan. If not, then just like Saudi Arabia sullies democratic nations, then NATO will also be seen to be “rotten and hypocritical.” Therefore, just how many people must be put in prison, lose jobs, and face ethnic or political persecution before NATO takes the crisis seriously in Turkey?